Several ancient civilizations chose concrete paving for their roads, plazas and urban streets. The ancient Romans, for example, built an extensive network of roads to make it easier to move their troops to distant territories. However, although these roads were no doubt appreciated by the soldiers marching along them, driving a modern car on them would have been a jarring experience. In the centuries that have since elapsed, better methods and materials have been invented for the construction of roads, streets and highways. In today’s world, asphalt has replaced concrete as the preferred choice for pavement for all of the following reasons. Installing concrete pavement is a time-consuming process. The ground must be prepared, forms constructed and rebar installed. Next, the concrete is poured and finished. You must then wait for up to a week for the concrete to cure before allowing traffic on the pavement. In most cases, asphalt pavement can be installed and open to traffic within 48 hours. Asphalt pavement offers significant savings over concrete. Installation costs are substantially less, and asphalt pavement is more economical to repair as well. Over the life of your pavement, you could save as much as 50 percent by choosing asphalt over concrete. Asphalt pavement offers a smoother, quieter ride than concrete. Asphalt provides better traction in all weather conditions, and snow or ice will melt faster on asphalt than concrete. Drivers on asphalt pavement will not be subjected to the harsh glare that can be generated when bright sunlight is reflected from concrete. All of these qualities make asphalt safer than concrete pavement. Asphalt pavement provides superior curb appeal for all types of properties. Freshly applied asphalt has a luxurious black color that most people find more attractive than concrete. From the lane markers on highways to crosswalks, pavement markings are easier to see on asphalt than they are on concrete. Furthermore, should the color of asphalt pavement fade, it can typically be restored by having fresh sealcoating applied. Asphalt Pavement Solutions is an asphalt contractor provides a full range of maintenance and repair services for all types of asphalt pavement. Since 1983, we have been offering our services to customers throughout Pennsylvania, New Jersey, Maryland and Delaware. 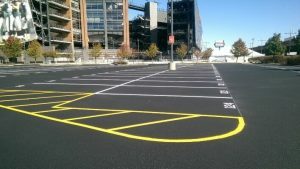 Our services include asphalt paving, sealcoating, crack and pothole repairs and parking lot striping. We also install car stops and bollards. Our crews have the training and experience to ensure quality work at reasonable rates. You can request a free quote by completing our online form, or you can call us at (856) 461-1710 or (800) 559-SEAL.